Have you ever seen this error notification on your DStv system? E30-4 We are confirming your subscription. This may take a few minutes. Dail *120*68584# or visit selfservice.dstv.com to clear this error. The DStv SMS reset is quite easy and painless. Next to a E48-32 There is no signal error an E30-4 error is most common. Also E16 error codes that is account related. Therefore knowing what to do when you get one of these errors is crucial. We do have a DStv Explora for sale in our online shop. There is amongst other products more than one DStv decoder for sale. One that will suit your needs. What causes a E30-4 Error? First of all let us start with what will cause a E30-4 Error. When your DStv decoder loses signal for a extended period of time it loses connection with the DStv satellite. Consequently when the connection is restored your DStv decoder needs to verify your account status. Therefore when this process is initiated your DStv decoder will display a E30-4 We are confirming your subscription Error. What can I do to clear a E30-4 Error? In conclusion this error does not mean that your DStv account is in arrears. This error will most probably clear with in the next 5 minutes. Therefore no action is needed but this isn’t always the case. Sometimes the error persist and intervention is needed. The onscreen notification gives you two ways to clear this error on their self service platform. Firstly you can dial *120*68584#. By doing this you will receive some prompts on your cell phone that will guide you thru the process of clearing different errors. In addition you can also visit their website selfservice.dstv.com to clear a E30-4 confirming your subscription error on your DStv Decoder. Am I able to clear a E48-32 There is no signal on this platform to? 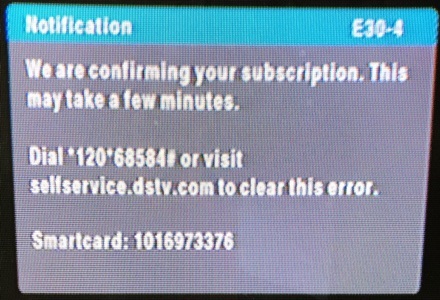 Unfortunately some error notification cannot be cleared by using the DStv self service platform. E48-32 is one of those errors. Therefore if you do have such an error you will need to refer back to your installation. Even Though we recommend you to use a well experienced DStv accredited installer to maintain your DStv installation. There is some points you could follow to rectify the problem yourself. Consequently we previously published a series of articles to assist DStv subscribers with this process. Here is links to previous articles that could assist you to clear a E48-32 Error. I suggest that you get an Multichoice accredited installer to inspect your installation. There might be a faulty cable or product failure. I have this E30-4 error on my DSTV decoder system, have call care center several time and several reset done on it, yet the error is still there. Have also visited an accredited distributors office, who did same reset without any picture showing. I really don’t happy at this situation. Kindly help or suggest something to help address this situation please. Yes you are most probably experiencing a problem with signal on your DStv installation. How can I rectify this problem. Customer or smartcard details are incorrect. We do not have access to the DStv accounting system. We are able to assist you with onsite support. Our service area include Pretoria and Centurion area. Good day, i have an Explora as my primary decoder and a DSD U3 for my extra view. recently i have been getting an E30-4 error message. I have tried one of my older decoders(same model) and made contact with the customer service for them to link the new smart card and decoder They have and cleared out all error messages but i am still getting the same error code. What can i do to clear it? The E30-4 error is a subscription issue. DStv must be able to clear it for you. As DStv installers we will be able to help you rectify any installation problem. But unfortunately we will not be able to assist with account activations. If the problem persists we will be able to send a DStv accredited installer to your premises to assist. Our service area include the Pretoria and Centurion area.